Avoid sweet drinks and snacks between meals (water or milk are the only safe drinks). Help/remind children to brush their teeth twice a day with fluoride toothpaste (see below for the amount and strength of toothpaste needed). The baby teeth come through (erupt) usually between 6 months and 3 years old. The adult teeth erupt (and the baby teeth are lost) usually between 6 years and 13 years old. The more often sugar is consumed during the day, the more likely you are to get tooth decay. It is therefore important to keep any sugary foods and drinks to meal times only and just eat low sugar foods between meals. Examples of "safe" snacking foods are : cheese, wholemeal bread (including sandwiches with savoury fillings), crackers/bread sticks, unsweetened wholegrain cereals, vegetables (such as cucumber or carrot sticks) and fresh fruit (not dried fruit). Examples of "safe" drinks are : water or milk. (Note - "low sugar" and "no added sugar" still contain sugar so are not "safe" for teeth. Also "diet" or "sugar free" while better than sugary drinks are still not "safe" as they have a high acidity level which causes tooth erosion). Fluoride helps to prevent tooth decay. Fluoride is contained naturally in certain foods and drinks, for example tea and fish. It is also present in some tap and mineral water. However these sources are usually insufficient for the ideal amounts of fluoride needed to protect teeth so other ways are required. The main way that we can get enough fluoride is by using fluoride toothpaste. Most toothpaste contains fluoride but there are different strengths of fluoride available. You need to look for the strength by looking for a number followed by "ppm" on the packet. The ideal strengths are given below. Parents should brush or supervise brushing. Use only a smear of toothpaste containing no less than 1000ppm fluoride (e.g Aquafresh Milk Teeth 0-3 yrs). As soon as teeth erupt in the mouth, brush them twice daily. Sugar should not be added to weaning foods. The frequency and amount of sugary food and drinks should be reduced and when consumed, limited to mealtimes. Sugars should not be consumed more than four times per day. Brush twice a day - last thing at night and on one other occasion. Use a pea-sized amount of toothpaste containing 1350 - 1500ppm fluoride (e.g.Colgate Total). Follow guidelines above for children aged 3-6 years but now use a normal amount of toothpaste on the brush (at least 1350ppm fluoride). It doesn't really matter how you brush your child's teeth or what brush is used as long as all the surfaces of the teeth and the gum margins are brushed. 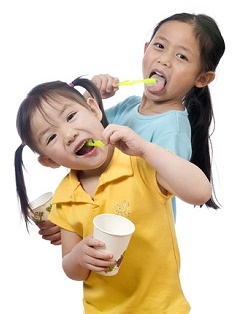 Try to make tooth brushing a routine part of daily life at the same times each day from a young age.